​It has been almost eighteen years in the research and writing! 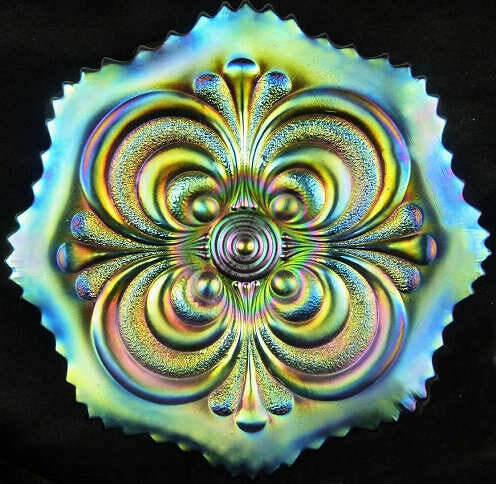 We’ve travelled thousands of miles visiting museums, collections, old glass works, archives and more, in our quest to fully research, document and "fact-check" the immense production of Carnival Glass in Europe. Our new e-book has almost 800 Carnival patterns from over 50 glassmakers all over Europe: fully illustrated and recorded in detail – featuring both catalogue illustrations and photos – plus an astonishing amount of previously unrecorded information. It is nearly 300 pages long. A phenomenal volume – extensive and incredibly far-reaching in its coverage. All in an accessible, low-cost and easy-to-read format, this unique and exclusive e-book will be available early in 2019. The old saying “if you can’t stand the heat, get out of the kitchen” surely had meaning for the glassworkers who made Carnival back in the early 1900s - except that they couldn't escape the hot conditions. It’s not easy for us to envisage what it must have been like back then, but consider this figure to get an idea! The average indoor temperature on the glass factory floor over the year varied between 100 and 130 degrees Fahrenheit (38 to 54°C). For this reason, many of the glass factories closed down in July and August because of the intense heat. You can read all about this and more in a fascinating new feature on our website that looks back at what it was like in the glass factories in those early days. Have ever wondered what a “warming-in boy” or a “mould boy” was, and were they all "boys"? Discover the answers and much more besides in our new website article (the link is at the bottom of this section). 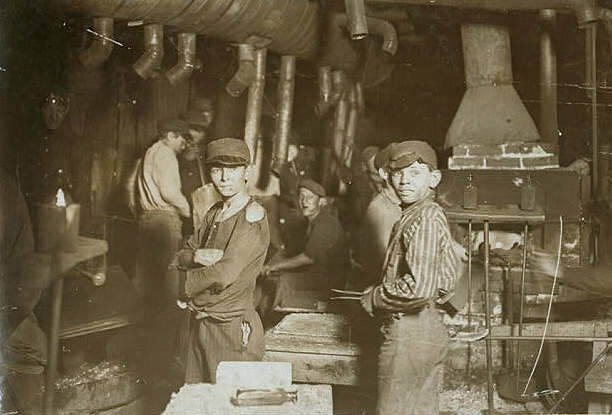 A glassworks in 1909, Indiana. Photo by Lewis Wickes Hine. (Source US Library of Congress). workers in this 1920 ad from a Wheeling newspaper! ​The 1919 newspaper ad above left is from a Wheeling newspaper, and it was a real eye-opener for us. 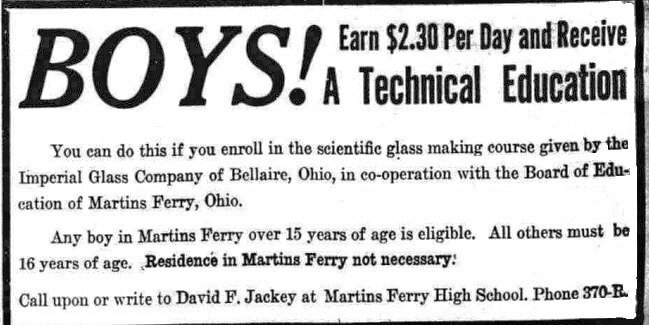 Imperial Glass was offering a “scientific glass making course” for young lads while in paid employment/training at their Bellaire glassworks. This was very forward looking – a technical education – vocational training. Discover the full feature here: Glassworkers Wanted! 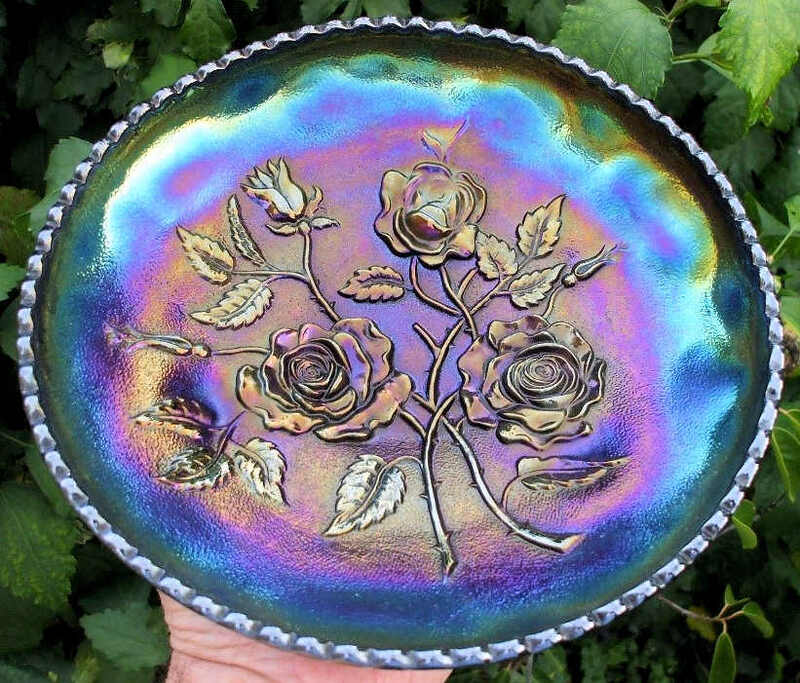 This magnificent Imperial Lustre Rose centrepiece bowl is shown here courtesy of Alan Henderson. Imperial at its best, with that stunning, vivid iridescence they did so well – it’s mouth-watering. We know this much-loved pattern as Lustre Rose (and its partner pattern, Open Rose) but did you know that Imperial gave this pattern its own name when they originally made it? ​It was called American Beauties (or American Beauty Rose). This wasn’t the only pattern Imperial assigned names to. Unfortunately, these early, original maker names were not known back in the 1960s when most of the Classic American Carnival designs were given pattern names by the early collectors. But it’s important and informative for us to know them now. These names were shown in Imperial’s "Catalog 101B" (c. 1915) which contained “Iridescent Novelties”. Can you guess what Imperial pattern was being referred to above? ​Interestingly, it was what we now call Scroll Embossed (shown on the right). Back in 1915, Imperial originally called it Persian Design (or Persian Pattern), and they called the flat plate in this pattern a “bread plate”. Oh my! Can you imagine sitting at the table and being offered bread on this beauty? The story behind the original Imperial name for what we all know as Heavy Grape nowadays, is even more informative and fascinating. It was originally called Colonial Grape, and the reason behind that name is all about the exterior design, that we refer to as Flute, but Imperial originally called Colonial. You can see all the original old Imperial catalogue images and more splendid photos of the Carnival, in this feature article: Imperial by Name! Imperial Lustre Rose centrepiece bowl, courtesy of Alan Henderson. ​In 1971, Imperial issued their very first plate in the “Twelve Days of Christmas” series. It featured the partridge in a pear tree and was offered in cobalt blue (the Aurora Jewels colour). But did you know that it wasn’t actually the first colour that they used? Imperial's ultra blue First Day of Christmas plate: this colour was put into production. So why did Imperial abandon the red-amberina plate and change to cobalt blue? ​Tony explains that it was clearly because Imperial had had difficulty with the colour and so they opted for the Aurora Jewels cobalt blue instead. So there you have it … what is currently the only reported red-amberina First Day of Christmas plate is shown here. Anyone know of another one? ​Sincere thanks to Tony for all the information. See all the Twelve Days of Christmas plates here: Twelve Days of Christmas. After many years of searching (and forever hoping to find one), we have finally been able to acquire the double stem version of Libochovice’s Sublime Deco candlestick, and place it in our collection alongside our single stem version. We felt you might enjoy it. The single and double stem versions (and an original Patent Application) feature in our unique Collectors Facts. Sublime Deco double stem candlestick in clear and frosted Carnival. ​This is an ad from 1917 America. What could be better than to sit back, admire your wonderful peacock patterned Carnival Glass and sip a "blessing from the gods of Olympus"! "Peacock is made from pure fruit juices and spices, blended by a special process. Nothing harmful or habit forming. 100% GOOD". It was promoted as a soda-fountain "tonic for grown-ups and kiddies".